When it comes to telling a story about war, the filmmaking game has been hitting many of the same strides for a couple of decades now. Ever since 1998's Saving Private Ryan and the opening scene set on Omaha Beach, war movies, especially those set during World War II, have been satisfied retreading that same water, rolling with similar tides, giving us much of what we've already seen before. It takes a true craftsman in the game to deliver something fresh but still maintain a sense of scope, compassion, and intensity. That craftsman, apparently, is Christopher Nolan, who has been reshaping genres and defying expectations since his 2000 thriller, Memento, floored audiences with its disjointed structure. Nolan is the craftsman, and Dunkirk, a WWII movie unlike any seen or experienced before, is the stunning result of his craft. Told over the course of one week in the extremely early days of the Second World War, the film quickly brushes over the necessary exposition setting the stage with simple narration through title cards. In the town of Dunkirk in the North of France, hundreds of thousands of Allied troops were trapped and surrounded by the invading, German forces. In May and June of 1940, these Allied soldiers were evacuated from the area with what little resources Britain, France, and Belgium could spare at the time. Needless to say, the evacuation was a long and arduous process with many Allied troops believing help and their salvation would never come. For many of them, it didn't before it was too late. With the setting established, Nolan drops us right into the thick of it all: the constant barrage of attacks against the troops lining the beach from the fighter planes buzzing around above them. Nolan, who also serves as the screenwriter here, isn't satisfied letting this play out in the typical way either. His screenplay is broken up over three, separate stories showing the events as they play out from the land, the sea, and even the air. Not satisfied with telling these individual stories in typical fashion, either, Nolan jumps between them, sometimes at the expense of straightforward continuity. The weeklong attempt of survival for the soldiers on the beach is edited along with the day-long trip it takes for the boats to reach the island from the mainland and the hour-long trip for the planes in the sky. It all comes across as somewhat confusing at first, but, once the timelines are established and begin to be fleshed out, it all moves together in a beautiful and riveting symphony of survivalism and heroism. Nolan's film is completely stripped of needless exposition or even the typical developments commonly found in films about war. We aren't given any backstory for any of the characters, and, oftentimes, we aren't even given a name to go along with the character. While this may appear to keep the emotion at an arm's length, the very notion of surviving an impossible situation and the bravery of those who faced it down comes through crystal clear. Dunkirk allows these ideas to speak for themselves without being bogged down by explanation. This may come across as awkward for some, but Nolan's structure here is deliberate and ends up benefiting the stories as a whole as well as the war film in which it makes up. The moments of silence are few and far between with Nolan inundating us with the constant dangers that surround these characters. He also utilizes Hans Zimmer's throbbing score as a character, itself, hardly ever falling away completely and constantly serving as a reminder that there is no rest for those involved. 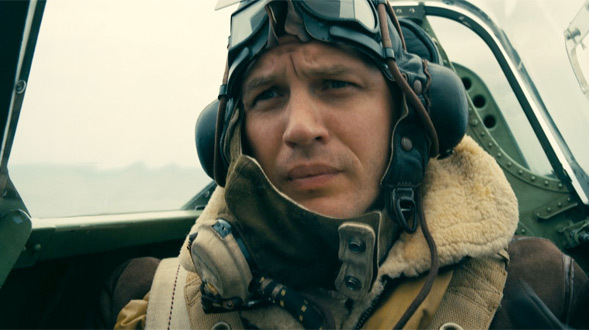 Likewise, the choices made in the film's narrative structure only help to amplify the harrowing task of those attempting to rescue these men, in particular the story of a Royal Air Force pilot (Tom Hardy) whose hour in the sky is a constant onslaught of bravery and danger. Hardy, to his credit, gives a resonating performance despite the simplicity of his story. As with many of Hardy's previous performances, his eyes do most of the talking, what they are saying giving off as much emotion as many, straightforward performances of this ilk. 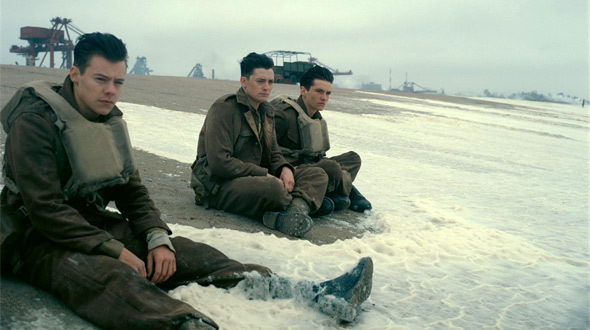 Likewise, the story of soldiers on the beach, particularly those played by Fionn Whitehead and Harry Styles, are filled to the brim with emotion despite the lack of commonly found narrative beats. The story told at sea, however, is the most powerful of them all with Mark Rylance giving an incredible performance as a civilian mariner en route to help with the evacuation. Rylance is rock steady and perfectly informed even with the lack of typical emotion to drive him, and it's this story that Nolan could have easily turned into a feature-length film all by itself. Christopher Nolan has quickly established himself as a filmmaker who is always looking for the road less traveled when it comes to the stories he tells. With Dunkirk, he has once again shaken up a genre and delivered something that will likely become the new establishment for future stories. Hard-hitting and wrapped in the inherent emotion that comes from stories about war, Dunkirk is an experience of World War II unlike any we've seen before. It has quickly become a wonder to guess where Nolan's career will take him next, but, with Dunkirk it will be even more interesting to see where war movies go from here.